The SparkFun Inventor s Kit for Photon is a great way to get started in the fresh IoT world and WiFi development. The SparkFun Inventorâ€™s Kit for Photon provides you not only with the Photon RedBoard but everything you need to hook up and experiment with multiple electronic circuits! With the Photon SIK you will be able to complete circuits that will teach you how to read sensors, drive motors, and more. 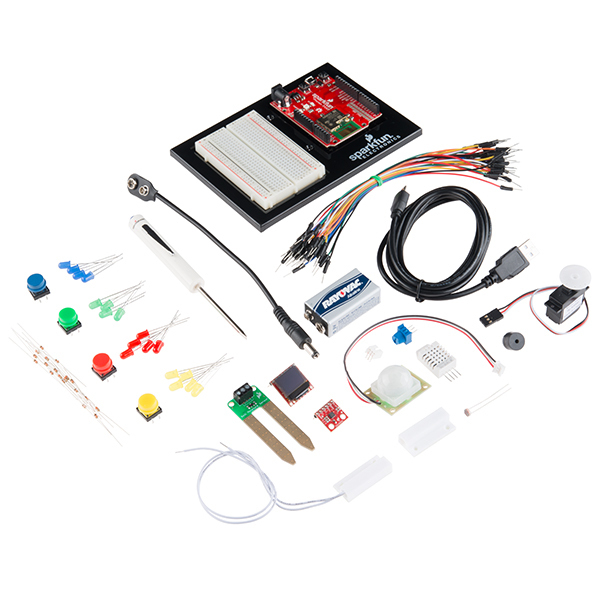 The SparkFun Inventorâ€™s Kit for Photon is the latest and greatest in Internet of Things kits. Whether youâ€™re a software developer just getting in to hardware, an EE learning software, or somewhere in between, this kit will help you get your projects hooked up to the Internet in no time. The kit does not require any soldering and is recommended for intermediate users. We have provided a complete Experiment Guide in the Documents section below for you to utilize and learn more about the Photon! If you are comfortable reading code libraries or if you have used the original SparkFun Inventorâ€™s Kit and are looking for the next step in programming education the Photon SIK is a perfect kit for you!